Ronald Quinn passed away on August 30, 2016 in Tucson, Arizona. He was 83. Ron Quinn has been a prolific writer of treasure hunting and paranormal stories over the past fifty years or more. Ron passed away on August 30, 2016. 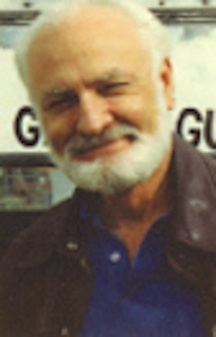 Several of Ron’s stories appeared in national magazines as well, including: "Southern Arizona Trails," "Treasur,e" "Treasure Search," "Fate," and "Arizona Highways." This book is a compilation of treasure hunting stories, some published and some unpublished. It has a special focus on Southern Arizona and his favorite town of Arivaca. After years of searching the mountains near Arivaca and Tubac where reported Spanish buried treasure lay hidden, Ron Quinn, his brother, and his friends finally unearthed a medium-size treasure south of Tucson, Arizona, which consisted of 82 pounds of Spanish gold bullion. Other trips were made throughout the years, but none as lengthy as the first two year odyssey around Arivca and Tumacacori, Arizona. 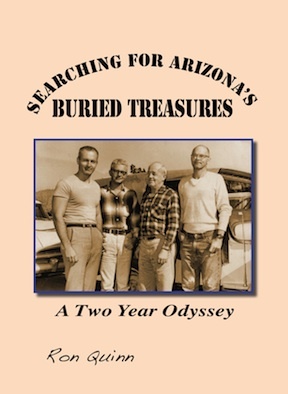 Read chapters from Ron's new book on treasure hunting in Southern Arizona below. Treasure hunting with Ron is a fun read as well as a great book for novice or seasoned treasure hunters. Follow the expedition and read sample chapters from Ron Quinn's new book on hunting for lost treasures in the Tumacacori Mountains, "Searching for Arizona's Buried Treasures"
About "Mysterious Disappearances and Other Strange Tales"
There are many strange stories that just cannot be explained. This is a collection of reported mysterious disappearances, odd happenings, sightings of little people and very strange, unexplained tales. Treasure hunter and author Ron Quinn's book, "Mysterious Disappearances and Other Strange Tales" is a combination of two books which Ron has compiled over the decades. Ron Quinn's stories have appeared in many sources over the decades. "Southern Arizona Trails" (or "Southern Arizona Trails International," as it was called for a short time) included stories in Spanish and was the source for the majority of these stories. Arizona Trails was published in Tubac, Arizona from 1986 to 1991 by George McGill. Ron’s stories were greatly enjoyed by the local residents and from time to time sparked controversy. These stories are over 50-years-old, so some changes are to be expected. Tumacácori National Monument has been redesignated as Tumacácori National Historical Park. Other similar changes will be noted from time to time throughout the book. Ron’s great sense of humor is reflected in his stories and especially his cartoons. © 2014-2017 Entertainment Magazine.EMOL.org All rights reserved.